Habitat for Humanity of Worcester County, Inc. (HFHWC) is hosting an upcoming”mini build” fundraiser. HFHWC has joined forces with the Bay Club/Carl Freeman Companies and Piney Island Construction to bring this creative project to fruition. Volunteers from the affiliate and both sponsors will build the playhouse to raffle off just in time for the holidays. Based on the 1950’s style stainless steel campers, and keeping in mind the timeless appeal of Assateague Island and neighboring coastal campgrounds, this colorful and fun playhouse will be the perfect backyard addition for the family who loves the outdoors. The playhouse is designed for children ages 3 to 10 with a total of 64 square feet of usable space, including a rooftop deck. 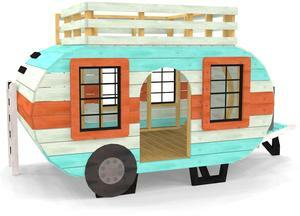 The camper design is a great way to inspire children to use their imaginations and dream of traveling. The playhouse will be on display at the HFHWC ReStore after November 16th, and will be featured on HFHWC’s float in the Berlin Christmas Parade on Dec. 6. Raffle tickets will be available to purchase beginning Nov. 9 at http://habitatworcester.org/happy-camper-playhouse/ and on site at the ReStore, located at 9026 Worcester Highway in Berlin. Tickets are (1) for $25 or (2) for $40. The winner will be announced mid-December.